The point of that whole shaggy dog tail is ginger: for 24 hours the ONLY thing that made me feel any better was a home-brewed ginger tea. In the past when I had nausea and vomiting I drank Ginger Ale. I hate the sugar but it always helps. That is if you have any one hand. We did not. . . And both of us were to sick to go to the store and get any. So I toddled out to the kitchen and cut up a bunch of ginger, stuck it in a pan, brought the concoction to a boil then shut if off and let the brew sit for a couple of hours. Eventually I took a Tablespoon of the brew and added it to a cup of boiling water and sipped it slowly. Amazing things happened. First of all it actually stayed down! It effectively stopped the vomiting and treated the nausea! 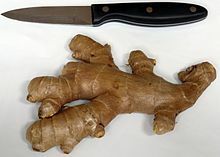 If you are unfortunate enough to get the flu remember that ginger is your new best friend. This entry was posted in GERD, IBS, Medicinal plants, Vitamins, Whole Food Plant-Based nutrition and tagged Flu Season, Ginger, Influenza, Nausea, Vomiting. Bookmark the permalink.